I'm SUPER excited for this design Pop-Up shop that JOIN and Brite Collective are organizing, which will be happening next week! eek!! 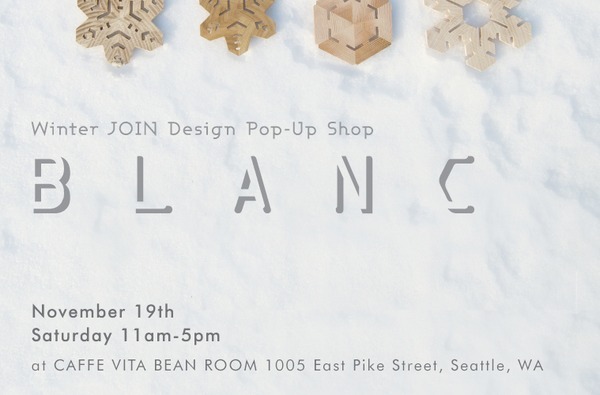 Its been awhile since we've done an event for both JOIN & Brite in Seattle, and figured this is the perfect time to gather everyone and jumpstart the shopping season with lots of awesome work from independent designers! We gathered 30+ designers and artists to do a special curated works under the theme BLANC. We're ready to ring in the winter holiday season with a one-of-a-kind market of great design. In celebration of winter, BLANC will feature a curated selection of limited edition objects that are white, blank, or otherwise achromous in color or spirit. Additionally, the pop-up shop will offer a cornucopia of other well-made goods from 30+ talented emerging designers from the West to the East. Celebrate independent design. Special preview of "BLANC" curated items, BLANC cocktail menu, live music, and more. Wear something white! 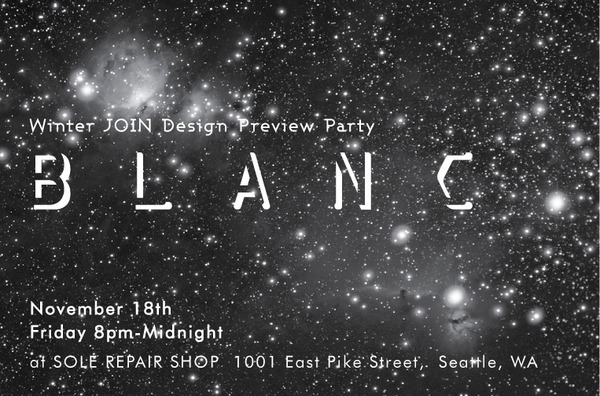 Time: 8:00pm - 9:30pm BLANC preview shopping event. 9:00pm - 12:00am DJ &amp; special guest performance by NODDY. Location: Sole Repair Shop 1001 East Pike Street Seattle, WA. Support independent design by checking off your gift list early with items from the BLANC curated collection as well as other original design goods ranging from furniture, art, housewares, jewelry, accessories, ornaments, and more. Also enjoy special activities by Brite Collective holiday, hot beverages from Caffe Vita, pizza by Big Mario's, and more. Location: Cafe Vita Bean Room 1005 East Pike Street Seattle, WA. Get a sneak preview here!